Here is a wonderful opportunity to live the dream in a stunning location with the added possibility to generate income from an established licensed holiday rental business. 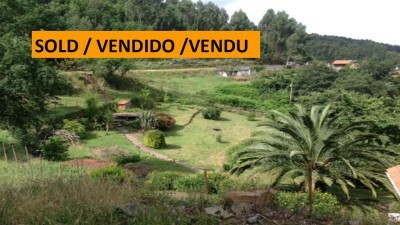 Nestling amongst a cluster of six houses in the beautiful hamlet of Vale Pereira da Serra you will find Casa no Ceu. Built from the local stone, this charming rustic dwelling plus quaint cottage and land offers many opportunities. A pretty path bordered by flowers and sweet smelling lavender and herbs meanders its way from the parking area to the house. The house, an old Portuguese dwelling, has been renovated and modernized, complementing the traditional style with a slightly more modern design to make the accommodation comfortable and attractive. A separate stone cottage, reminiscent of a little gingerbread house, is located only 200m away. This two storey house has 3 double bedrooms, 2 bathrooms (one en suite), lounge, kitchen, storeroom/utility room, wood store and a sun terrace. The main entrance opens into a bright lounge which has wooden floors and ceilings, a double wooden framed window with a built in window seat and storage, and a wood burner. Doors from here lead to a double bedroom with built in wardrobes and access to the loft. This has the potential to become further accommodation with the addition of dormer windows. Next door is the family bathroom which has a bath with an overhead shower, a bidet, wc and sink. The original wooden beam above the door is an added feature. There is a door from the lounge into the lovely galley style kitchen which has a tiled floor, pine ceiling, wooden wall and base units, marble worktops, a gas hob, electric oven and new gas boiler. The breakfast bar has wonderful views over the surrounding area. Stairs lead from the kitchen to the second double bedroom which has a lovely vaulted ceiling, a tiled floor and a large window with more spectacular views over valley below. An original wooden door leads to external slate steps and a paved area with access to a self contained double bedroom and en suite shower room. The third bedroom has wooden floors and ceilings and thick stone walls. The en suite has a shower, sink and wc. Next door is a store room/utility room with plumbing for a washing machine plus a further store room for logs/bike lock up etc. To the rear of the house is a spiral staircase leading to a sunny terrace with the most breathtaking views. Enjoy the panoramic views during daylight hours and then drink a toast to the most spectacular sunsets. The lounge has a vaulted pine ceiling, a feature chimney and fireplace with a wood burner and wooden floors. The kitchen area includes wooden base units, granite worktops and a double sink. The bedroom has a vaulted wooden ceiling, wooden floors and exposed stone walls. The shower room is tiled with exposed stone features and has a shower, bidet, toilet and sink. There are internal windows between the shower room and bedroom and the bedroom and lounge area. From the patio/BBQ area you can enjoy stunning views over the gardens and the valley beyond. There is a garden shed and possible suitable areas for a small pool. To the rear of the property is a separate piece of woodland which is included in the price and could potentially be ideal for adding further rental opportunities. Here you have the best of both worlds, the peace and tranquility of the Serra de Lousa, with stunning views, a true paradise for hikers, bikers, nature and wildlife lovers, yet only a six minute drive to the nearest bar/café and only 12 minutes from the town of Lousa with everything you could wish for, supermarkets, banks, restaurants, swimming pools, the river beaches and places of historical interest. Vale Pereira da Serra is accessed by a tarmac road up to the final 300 meters where it becomes a well maintained flat track. The nearest train station is Coimbra, a 45 minute drive, the bus station in Lousa is only a 12 minute drive and the nearest motorway, A13 route south, is a 20 minute drive from the house.